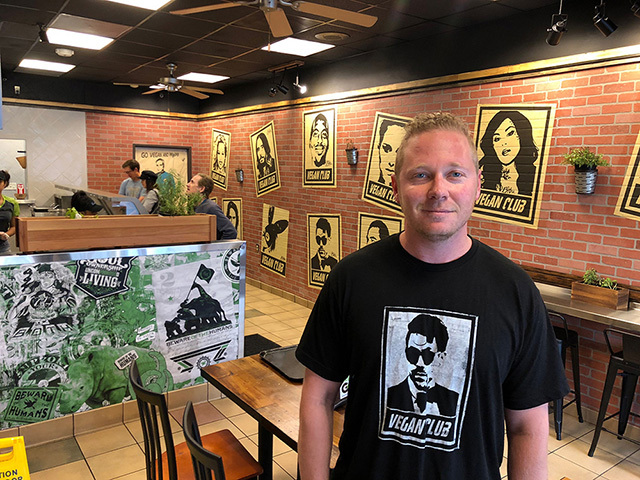 Tyler Beerman, the brewmaster and manager at Conscious Kombucha, the maker of sweetened fermented teas, has created a new local business: the Mexican restaurant Vegan Green GO which opened recently at 3613 State Street, the former home of Miso Hungry and Subway which is between Baskin Robbins and Rudy’s. On the main menu Vegan Green GO offers burritos, tacos, nachos or a bowl ranging in price from $11 to $15. You choose your carbs (Mexican rice with refried beans or potatoes with bell peppers-) and your protein (carne asada, chicken, chorizo, al pastor, and barbacoa), again using house-made faux meat. A variety of fixings and extras are available. Call 805-318-3161. I love Vegan Green Go!!! It is sooooo good!! Thank you for bringing this to Santa Barbara!! So fresh and healthy!! Good luck. I’m a carnivore that tries to eat a vegetarian dinner once or twice a week, but considering how cheap potatoes, beans, grains and soy are, this $11-15 price point might present a problem as a fast casual looking setup. Who knows, but a meatless $11+ burrito better be pretty damned good and even then it’s going to be an uphill battle. Hope they find a market.